"Cast & Place" by Team Aesop (Josh Draper, Lisa Ramsburg, Powell Draper, Edward M. Segal, and Max Dowd) will be on display this summer on Governors Island. 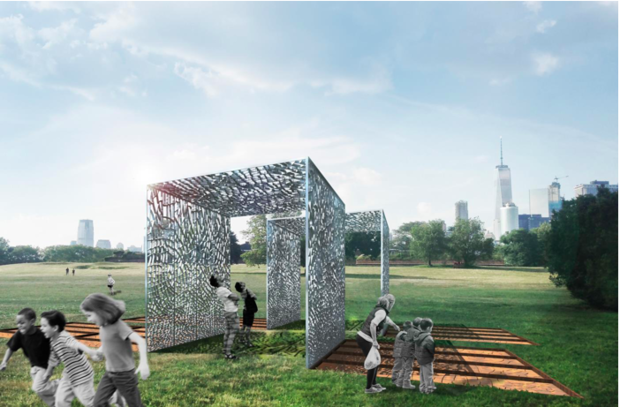 GOVERNORS ISLAND — A massive canopy made from 300,000 melted cans and clay excavated from Queens will find a home on Governors Island this summer. The quirky, eco-friendly structure — called "Cast & Place" — is the winner of FIGMENT arts festival’s annual City of Dreams Pavilion design competition. The goal of the competition, now in its seventh year, is to give young designers the chance to create whimsical structures from unexpected, sustainable materials, the arts organization said. The pavilions are also meant to give visitors to the island a interesting way to interact with public art. "Cast & Place reimagines waste as a transformative resource for our New York City future," FIGMENT said in a statement. The canopy is made from pouring the melted aluminum cans into dried, cracked clay, producing a unique design for the pavilion. "The results are light, strong panels that provide structure and shade, assembled into spaces for performance and play," FIGMENT said. FIGMENT, a nonprofit arts organization that hosts public art installations across the country, runs the annual contest in partnership with the Structural Engineers Association of New York and the Emerging New York Architects Committee of the American Institute of Architects NYC Chapter. The designers behind "Cast & Place" are raising money for the canopy and its maintenance on Kickstarter.